Be there for the loggerhead's breakfast! Plan a visit to the Aquarium, buy your tickets online. 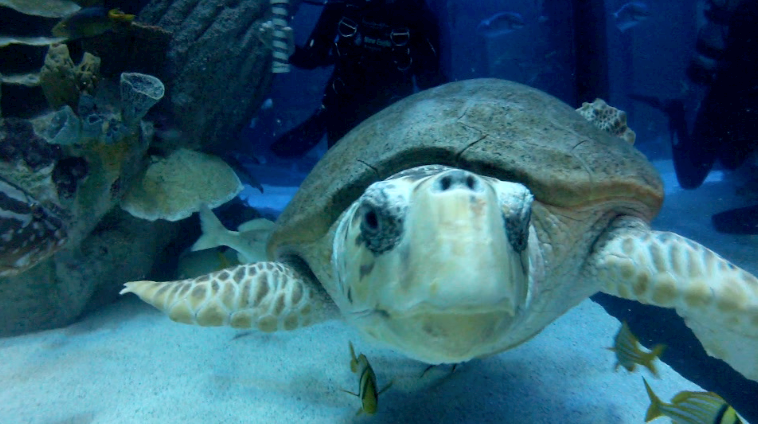 In our last post, we talked about how the loggerhead sea turtles are fed. And here's an up-close underwater look at a live feeding! Notice how the turtles—once down at the feeding station—associate the diver with their food. Carolina in the beginning thought I was going to feed her (all I had was the GoPro though). Also, sometimes it can be tough to get the turtles situated before beginning the feeding. However, Evie got the turtles lined up nicely, and fed them their 2.5 lbs of squid and capelin (we call them squid tacos) without a hitch. People often ask us if it's dangerous to dive in the Giant Ocean Tank. The answer is no, but that's only because we are safety-minded. The loggerhead feeding is a good example. Without the use of the stick, we would run the risk of getting our fingers or hands bitten by these strong-jawed sea turtles.